Use Zoho Social to manage multiple social networks, schedule unlimited posts, monitor keywords, and collaborate with your team — all from a single dashboard. Zoho CRM Plus is a tightly integrated, all-in-one customer engagement suite. Give your customer-facing teams a 360-degree, contextual view of your customers across all touch points to provide a seamless and consistent experience at every stage of the customer journey. There’s more than one way to publish a post. Create & Publish – Create content for popular social networks. Publish right away or schedule posts for later. You can also save your post as a draft to discuss with your team. 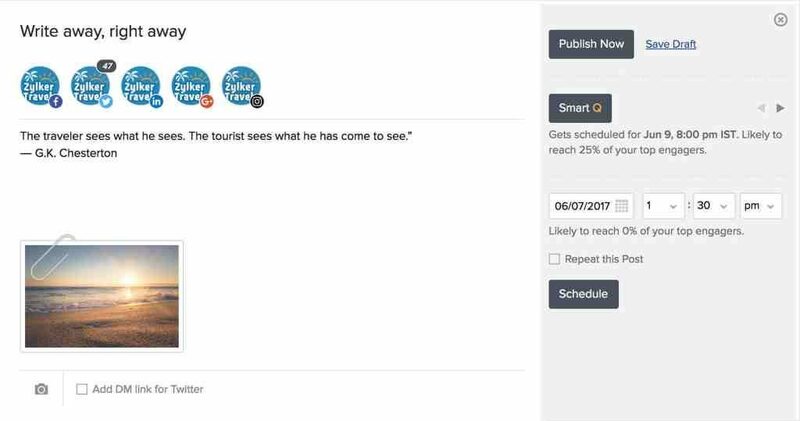 Smart-schedule with SmartQ – Select SmartQ and we’ll automagically schedule your post to go out at a time when most of your audience is likely to view it. Bulk Scheduler – Schedule multiple social media posts in one go, using the bulk-scheduler. Add images by mentioning their URL. Manage your content calendar more efficiently. Zoho SocialShare – The easiest way for your brand to share content. Share interesting content – Great brands share awesome content with their audience on social media. The next time you stumble on an interesting article, just click on Zoho SocialShare icon on the browser and share it with your audience across all your networks. You can also schedule posts to go out later. Share Text Selectively – Fancy sharing your favorite lines from an article? Just select them and hit share. You can even select text from various sections of an article. Target the right audience at the right time – We know you love the SmartQ feature and we built it within Zoho SocialShare for you. Imagine the power of scheduling your favorite content to reach and engage your audience at the best times, from right within your browser! Content – Brainstorm content ideas and work together to craft the best copy for your posts. Brand Mentions – Co-create your responses to critical Brand Mentions with your team. You can come up with interesting ways to engage with your key connections. 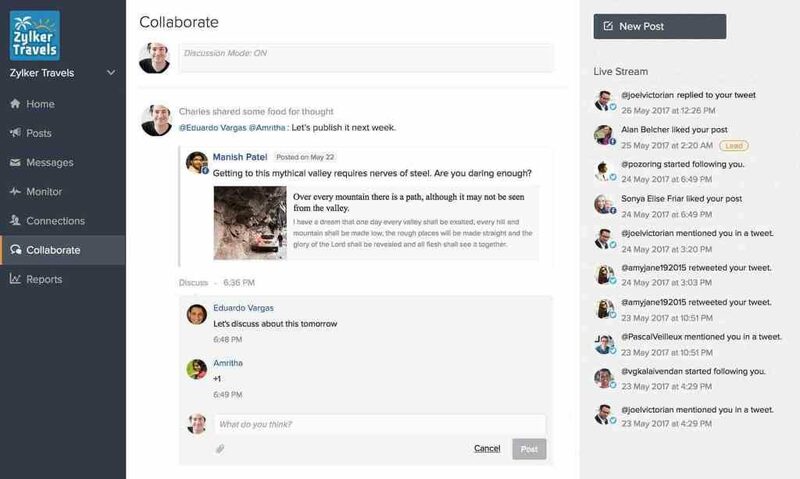 Reports – Discuss social media performance reports and share insights with your team. Work together to plan your social media strategy. Brand Mentions – Keep track of what people are saying about your Brand with Brand Mentions. Reply to them instantly or look into the conversation history for more context. Search – Listen to conversations and discover new prospects for your business. Track competitors, events and hashtags with Search Keywords and save them for future. 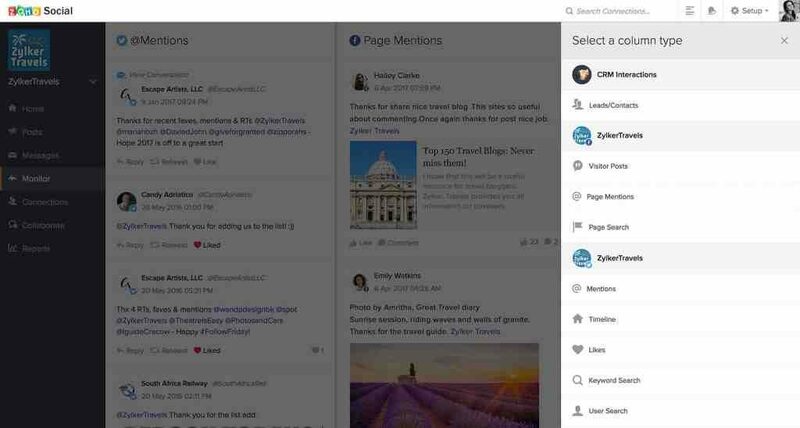 Twitter Lists – Access all your twitter lists under the Monitor tab. Stay organized and manage them smartly. You can even save them as separate columns. Gain meaningful insights about your brand’s social media presence with visual reports. 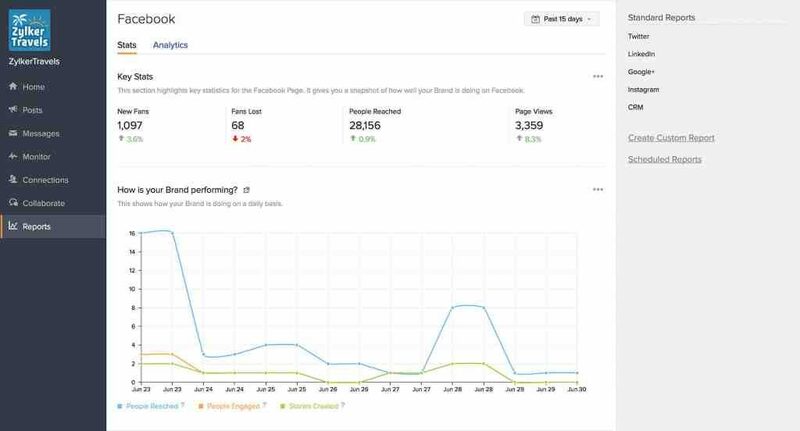 Glance at the basic stats or dive deeper to understand your brand’s performance with detailed analytics. Grow your business with a free online Zoho Social. The basic edition is free for the first user, but it can scale to several hundred users.